You may still be able to book by calling the hotel at 305-372-0313. 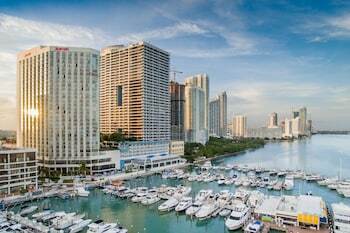 From your room at the Doubletree Grand Hotel Biscayne Bay, you can fulfill wanderlust tendencies vicariously by watching the boats come and go in the Sea Isle Marina. The guest rooms and suites, with decor taking a cue from the tropics, offer views of the bay, park or lush gardens. Fully-equipped condos with complete kitchens and stunning marble baths are available with one or two bedrooms. There's a low-key luxury throughout the hotel and the restaurants as well, which range from fine dining to casual deli fare. Keep up with your daily routine at the fitness center, or get hoppin' on the tennis court. An Olympic-sized heated outdoor pool ensures you can swim laps, or simply float or splash about, no matter what time of year you visit. 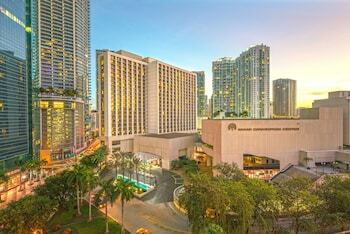 DoubleTree by Hilton Grand Hotel Biscayne Bay is a 3.5-star hotel located at 1717 N Bayshore Dr, Miami, FL 33132, US . Its nightly price usually falls between $130.34 per night and $1121.215 per night, excluding tax, depending on room category. $130 per night found for a Hilton Honors Discount -Honors Discount - 2 Double Beds Park View - Mini Fridge - Marble Flooring - 500-600 Sq Ft room type. DoubleTree by Hilton Grand Hotel Biscayne Bay sells rooms through sites like Room 77, Expedia, Hotels.com, GetARoom, and many others. Room 77 searches across dozens of different sites to find the lowest discount rates available. The lowest rate we've seen over the last few weeks was found on Room 77. In 1% of the cases we surveyed, all sites offered the same rate. You can compare real-time rates from all of these sites on Room 77. Room 77 is the only hotel shopping site that includes special discounts like AAA, senior, government, military, and corporate rates.